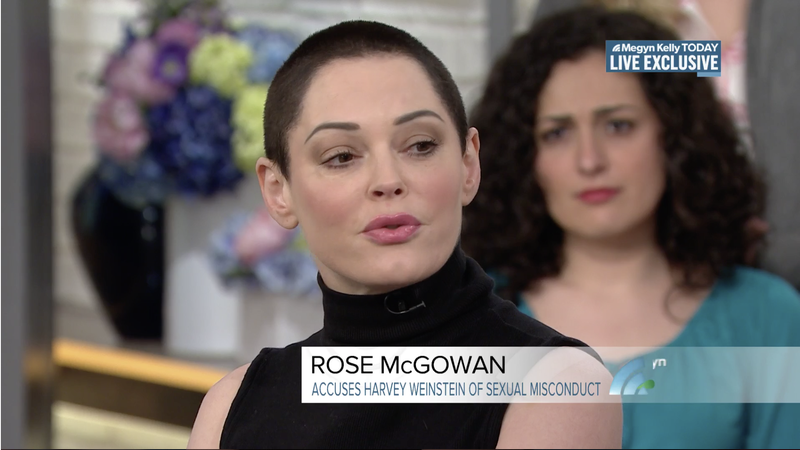 Rose McGowan appeared on Megyn Kelly Today Friday morning to share her thoughts regarding the arrest of Harvey Weinstein, the man she and so many other women have accused of sexual assault, and who torpedoed her career and reputation in a twisted scheme involving Mossad agents uncovered by The New Yorker last year. You can watch the entire interview here, here, and here, but I’ve pulled some of McGowan’s most notable statements below. I actually didn’t believe this day would come, and I’m so proud of [Lucia Evans and Paz de la Huerta]...But this is a big strike into the heart of abuse of power, and it shows people worldwide...that this cannot and will not stand. MCGOWAN: No. No he did not. KELLY: Because the system was created to protect men like him. MCGOWAN: The system was created by men like him...He had the nerve to walk in the Women’s March down the street at Sundance, where he raped me. That’s intense. Absolutely. Completely. And that’s a tragic thing. It’s tragic that it takes over 100 women. And that probably means 1000, let’s be real... I mean, this man had hunting grounds all over the world. He had accomplices—a complicity machine. He was the cult leader of Hollywood, their king...He tied with God for thanks at the Oscars...And to see that constantly, and to live in that town...to see people lay wreaths at his feet even though they knew, today was a good day. KELLY: I have to ask you about Georgina Chapman, [who suggested] she was completely shocked by all of this. And even we’ve seen [Scarlett Johansson], who wore her gown, Marchesa, to the Oscars. What did you make of that? MCGOWAN: I thought it was an ugly gown. KELLY: What did you think of her suggestion that she didn’t know? MCGOWAN: It’s a very tough situation to be a woman and to call out another woman, but I was sat between them—between Harvey Weinstein and Georgina Chapman—at Cannes about seven or eight years ago. I was purposely sat there. It was very awkward. She wouldn’t look at my face. That’s all I’m going to say about that. What do you want to see happen to him? I don’t ever wanna see him again. I think the world could use that face being gone. Couldn’t we all? On what she would say to him in person, if given the chance. I don’t want to, because it’s not about me. I’m just a representative for all of us who’ve been hurt. I want to forgive the world for hurting people, and he’s a part of that. I think there are so many others that I need to forgive even before him. But I don’t—it’s a very complex issue. And maybe I’ll get there someday... It’s all a process. We’re all going through this together... But I can say this: The man who pinned me down had handcuffs on today.